The banknote paper consists of pure cotton, which feels crisp and firm (not limp or waxy). Special printing makes the ink feel raised or thicker in the main image, the lettering and the value numerals on the front of the banknotes. To feel the raised print, run your finger over 200 Euro note or scratch it gently with your fingernail. 1.Marks printed in the top corner of the 200 Euro note (pos. 1 specimen 1), on both sides, combine perfectly to form the value numeral. You can see the complete number when holding the banknote against the light. The watermark is produced by varying the thickness of the paper. It appears when you hold the banknote against the light. If you put the banknote on a dark surface the light areas become darker. This effect is very easy to see in the value watermark. The security thread is embedded in the banknote paper. Hold the 200 Euro note against the light - the thread will appear as a dark stripe. 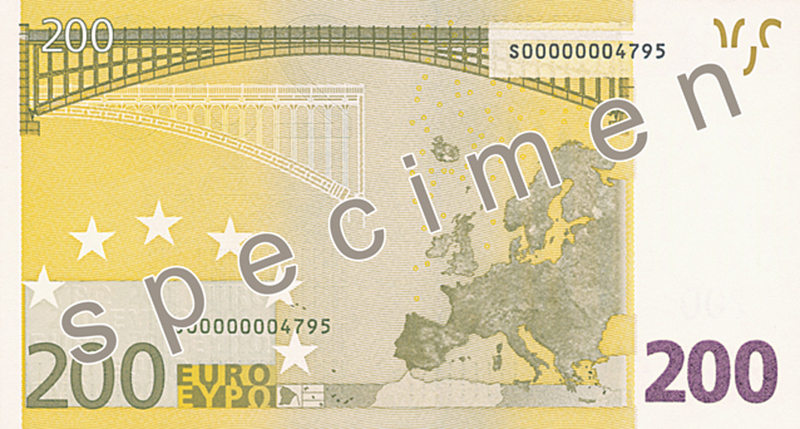 The word "EURO" and the value can be seen in tiny letters on the stripe. Hold the banknote against the light. In the hologram you will see perforations which form the euro symbol. You can also see small numbers showing the value. 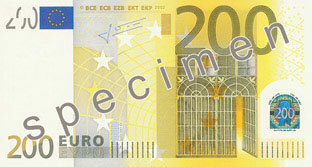 Tilt the 200 Euro note – the hologram image will change between the value and a window or doorway. In the background, you can see rainbow-coloured concentric circles of tiny letters moving from the centre to the edges of the patch. Tilt the banknote – the value numeral on the back will change colour from purple to olive green or brown. 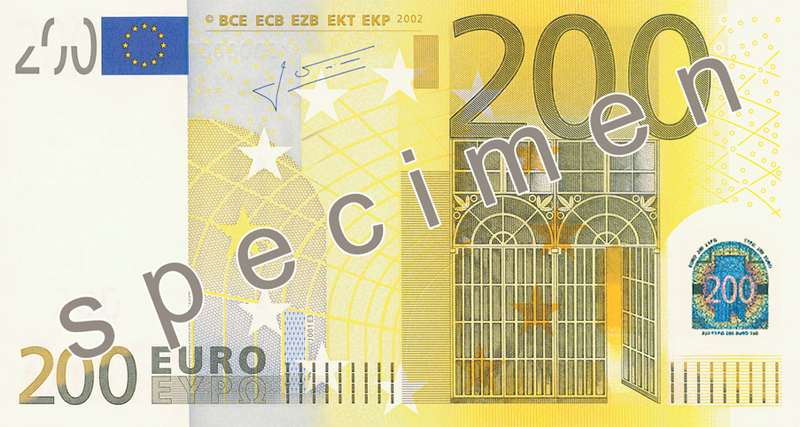 On some areas of the 200 Euro note you can see tiny writing, e.g. inside the "EYP?" (EURO in Greek characters) on the front. You will need a magnifying glass to see it. The microprinting is sharp (not blurred). + the paper itself does not glow. + fibres embedded in the paper appear, coloured red, blue and green. + the flag of the European Union looks green and has orange stars. + the signature of the ECB President turns green. + the large stars and small circles on the front glow. The map, bridge and value numeral on the back appear in yellow.